BROOKLYN, N.Y., Dec 21, 2016 (SEND2PRESS NEWSWIRE) — Returning champions and promising newcomers from Boston to Virginia in first grade through college and beyond competed this weekend at the opening preliminary meet of the Colgate Women’s Games, the nation’s largest female amateur indoor track and field series. Among the highlights this weekend; Avery Lewis of Friends’ Central School, who set two Colgate Women’s Games Records last season as an Elementary A competitor, moved up one age/grade division to Elementary B and set another record Sunday at the first preliminary meet of 43rd annual Colgate Women’s Games. In the High School division Friday evening, Dylann Core of Astor Collegiate Academy in the Bronx scored a double win against a tough field of veteran high school sprinters, crossing the tape in the 55M in 7.25 and the 200m in 26.08. Core’s victories are especially notable after placing 4th and 7th earlier this year at the AAU Invitational behind club teammates and returning high school champions in these fields. Another fast rising star, New Jersey’s Athing Mu of Trenton Central also scored a double win, placing first in the 400M (60.9) and the 800M (2:26.2). National champion My’Khiya Williams, who holds Colgate Women’s Games records in the Elementary B and Mid School high jump, cleared the bar at 5’4″ for the win. In the Mid School division on Saturday, returning champion Brianna Brown of Bronx Latin won both the 200m (25.91) and 400 Meters (60.22); faster times than high school leaders in these events. Brown, who holds two national age division USATF records, was awarded the Colgate Games’ trophy for “Outstanding Competitor at the Finals” last season. Now a 7th grader, she began competing in the Colgate Women’s Games as an Elementary A competitor and has placed first overall in every event each year since. “This year women’s track and field has been in the spotlight from the 2016 Olympics in Rio where Team USA featured six athletes who participated in the Colgate Women’s Games. The Games have now produced 26 Olympians and hundreds of national age/grade division champions, an inspiration to the thousands of girls and young women of all ages and abilities that compete each year. While top talent often gets the buzz, the Colgate Games are very much about gaining experience and self-esteem and the importance of continuing education for all who participate,” Toussaint said. Also on Saturday, in the College Open division, Chante Moore of Gwynedd Mercy University in Pennsylvania won the 200M in 25.38 and the 400M in 58.3; fast opening meet races for the Pennsylvania High School Indoor and Outdoor track state champion, and the division’s best 200M and 400M times in recent history. Brooklyn’s Kezzian Jones won the shot put with a toss of 11.86M. The sophomore broke multiple Kingsborough College throwing records earlier this year including the shot put with a toss of 12.38M. 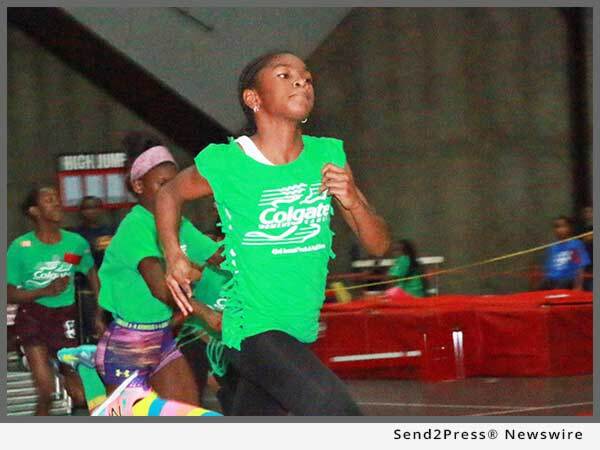 On Sunday in the Elementary A division, 8-year old track sensation Junior Olympic champion Damira Allen of Chester Charter School in Pennsylvania won the 400M in 1:10.05 and the 800M in 2:34.5. Allen set a record as a 7 year-old in the ESPN Games with a 400M time of 1:09.39; and another this year at the AAU Junior Olympics in August in Texas with an astonishing 1:05.89 performance. The Colgate Women’s Games division record stands at 1:05.91 set by Philadelphia’s Kenai Bey-English in 2015. Allen’s 800M 2.34.5 is her fastest time at any major meet yet, and less than 2 seconds off a 30 year-old Colgate Women’s Games record set in 1986 set by All American Jawauna McMullen. – Photo Caption: Philadelphia’s Avery Lewis Sets Her Third Age Division Record at the Opening Meet of the 43rd annual Colgate Women’s Games, at Pratt Institute, Brooklyn, N.Y. this weekend.